Sometimes when Windows won't see a disk drive it is still visible from Linux. This is mainly because Windows' drivers for mounting filesystems are more strict than Linux's. If there are a few files that are very important on the drive, you can try to copy them using this method before proceeding with a repair that may fail and make it much more difficult to recover the files. When it finishes booting you will notice that it looks kind of like a Windows desktop. The button in the lower left works like the START button in Windows XP and allows you to select and run various programs or shutdown the computer. To make things easy, I'll just refer to this as the START button. Click the MOUNT DEVICES button which is down by the START button. 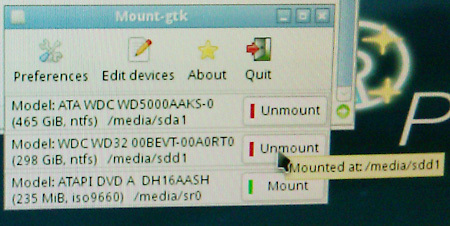 You want to click the green MOUNT button next to the bad drive and the drive that you want to copy to. Once you have mounted both the bad drive and the new drive that we are copying to, you will notice that the File Manager window opened also when you clicked the MOUNT DEVICES button. In it you will see folders representing your drives. 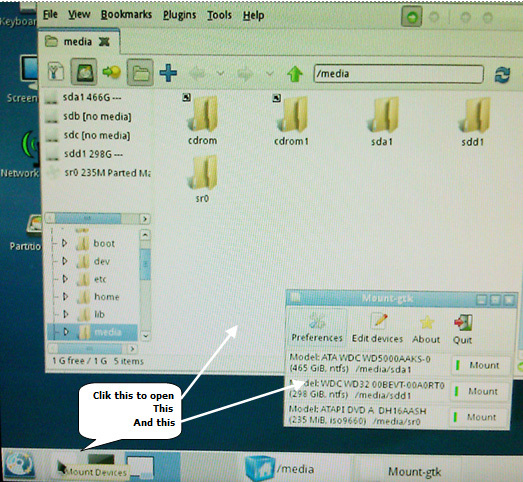 The File Manager window should be displaying the contents of the /media folder and your drives will be folders called sda1 and sdd1 (though yours may have different names that you got by looking next to the MOUNT button which should say UNMOUNT now). Double click the folder for your bad drive and if you see your files and folders then simply select what you want to copy to the good drive and right-click and choose COPY. Then navigate to the folder that represents the drive you want to copy them to and right-click and choose PASTE just like if you were in Windows Explorer. Click START>LOGOUT and choose SHUTDOWN THE COMPUTER and click OK. We don't want to stress the bad drive any more than neccesary so if it is an external disconnect it. Now boot into Windows and verify that the files were properly copied to the good drive.